Christine Steiner knew something wasn’t right with her youngest child, Olivia. After a month of viral illness diagnoses she demanded blood tests. The result was ALL – acute lymphoblastic leukemia, also known as acute lymphocytic or lymphoid leukemia. The date, June 15, 2015 is etched in her memory. Christine recalls the first two weeks of Olivia’s hospitalization as tough. An infection nearly sent the toddler to the Intensive Care Unit. 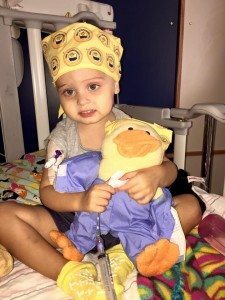 “They gave her a Chemo Duck right before she had her port placed and it was so helpful because they were able to show her how they were going to give her the medicines and what they were going to do,” continued Christine . Duckie was not only helpful to Olivia, but also useful for her older siblings ages nine, eight and six years old. Christine taught them about the port that was inserted under Olivia’s skin and how doctors give her the life-saving medicine to treat her cancer. 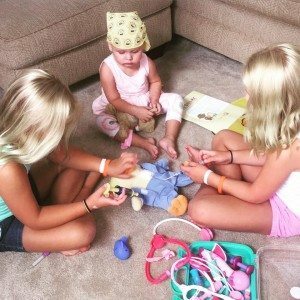 Liv and a fellow cancer patient often play with their Chemo Ducks together while at the Jimmy Fund Clinic at the Dana Farber Cancer Institute.